I've been here since last Wednesday, so we've been here for almost a week already. Other than the great food that I already mentioned, I've just been practicing a lot - hopefully this week I can see some places here, like maybe the hot springs, which we went to see two years ago. It's a beautiful place. I've come to this tournament four times now and it's just getting bigger and bigger - the tournament and the organization is great, they're always thinking about the players and they know the sport really well, so we're always very happy to come here. The arena is really nice and the hotel is really close by, so we have no stress - I think that's why all of us can enjoy it so much whenever we come here. I actually had my first match of the week in doubles today, with my partner Zhang Shuai. Unfortunately we didn't win. I haven't played much doubles since my last WTA event in Osaka, so I didn't really have the best feel for doubles today, and we didn't play together for a while, so it wasn't going too well at the beginning. Also she just got here, so it was tough for her to adjust. It was just a difficult situation for us. But our opponents played very well, and we'll play more tournaments together next year! I have another interesting situation - I'm the No.1 seed in singles and doubles here. But there are so many good players in the draw, it really doesn't mean anything - it's just a number, same as my age! Now I'll just have something to eat, some Chinese food, then I'll prepare for tomorrow's match. Kimiko Date-Krumm upset defending champion Daniela Hantuchova at the Aegon Classic to do something she hadn't done since '96 - what is it? BIRMINGHAM, England - She's achieved a lot since coming back to the WTA in 2008, but apparently she's nowhere near done. Kimiko Date-Krumm reached the biggest quarterfinal of her comeback at the Aegon Classic on Thursday, and in style too, taking out defending champion Daniela Hantuchova. Having come back from match point down to take out No.12 seed Monica Puig the day before, Date-Krumm looked like she was in for another battle against the No.7-seeded Hantuchova, breaking mid-way through the first set but facing a break point while serving for that opening frame at 5-4, ad-out. But Date-Krumm never lost another game. She won three points in a row to sneak out the set, and then raced through the second set at love in just 27 minutes, eventually walking off a 6-4, 6-0 winner. And what about the biggest quarterfinal of her comeback? Date-Krumm had been to the quarterfinals or better of WTA events 10 times in her comeback before this, but this is the first time she has been to the quarterfinals of a Premier-level event or higher since the WTA Finals all the way back in 1996 (there she fell to Martina Hingis in the quarterfinals then subsequently went into retirement). Z Andreą po wygranym meczu deblowym w Montrealu. 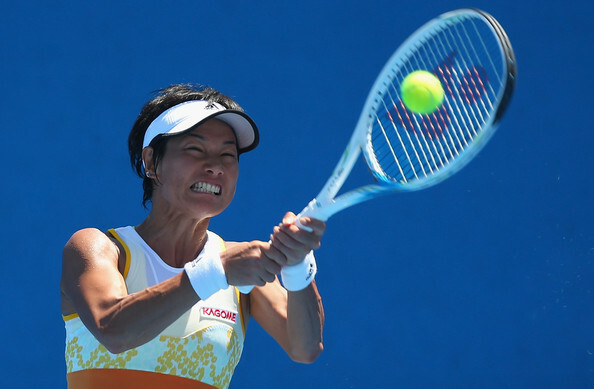 It’s impressive enough to be competing in the US Open at the age of 43, but legendary Kimiko Date-Krumm of Japan is continuing to record career milestones. The oldest player on tour, man or woman, is still alive in the women’s doubles event with Barbora Zahlavova Strycova of Czech Republic. Playing No. 2 seeds and French Open doubles champions Su-Wei Hsieh of Chinese Taipei and Shuai Peng of China, the pair delighted the Court 17 crowd with stunning reflexes at the net and a major upset victory, 7-6, 6-4. The win marked the first time in 20 years that Date-Krumm has reached a quarterfinal at the US Open, which she achieved in singles back in 1994. Date-Krumm was a mainstay on the WTA tour in the early and mid-‘90s, reaching the semifinals of every Grand Slam except the US Open and reaching a career-high ranking of No. 4 in November 1995. But at the peak of her career, she became burned out by life on tour and retired at the end of 1996. Date-Krumm found plenty of things to keep her busy. She married German racecar driver Michael Krumm in 2001, raised funds to build a school in Laos, and ran the 2004 London Marathon in a time of three hours, 30 minutes, all while holding coaching sessions for kids across the world. She’s even given running advice to No. 10 seed Caroline Wozniacki, who plans to run the New York City marathon later this year. 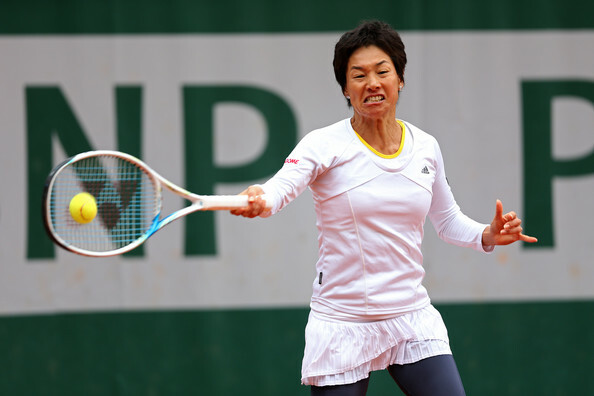 But Date-Krumm eventually began to miss tennis. Twelve years after retiring, she returned to professional tennis in 2008. Eighteen months later, she won the WTA event in Seoul in 2009, just one day before her 39th birthday. She has since recorded Top 10 victories over players including Maria Sharapova and Dinara Safina. This year at the US Open, she took former world No. 1 and two-time US Open champion Venus Williams to the brink before narrowly losing in three sets. 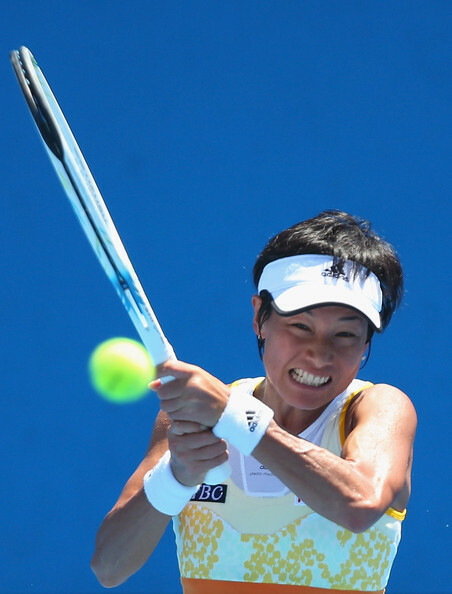 She’s set to turn 44 later this month, but Date-Krumm is still ranked among the world’s Top 100 in singles. "there weren’t things like Skype"
"She’s even given running advice to No. 10 seed Caroline Wozniacki, who plans to run the New York City marathon later this year"
" I also do simple things like eat a lot, sleep a lot, drink a lot of water." w efekcie czego nie mogła przez dłuższy czas trenować i konieczna okazała się rehabilitacja kolana. Co się dzieje z Kimiko ? Od Kwalifikacji AO, Japonka nie gra. Czyżby dalej problemy zdrowotne ? Czy już ostatecznie powiedziała do widzenia swojej karierze ?